Mike Elk was the only national reporter to attend the 5,000 person Historic "March on Mississippi" against Nissan. Today, the United Auto Workers filed a petition with the NLRB asking for a vote for the 6,500- worker plant in Canton, Mississippi. If successful, the vote would top off a historic 14-year long campaign to unionize the plant and would be a major breakthrough for efforts to organize the South. The UAW did not immediately respond to a request for statement about its filing. They intend to hold a press conference in Canton tomorrow to announce their drive. Sources tell Payday Report that they proposed bargaining unit will include all hourly production and maintenance employees at the plant. The UAW expects Nissan to dispute the size of the bargaining unit, so it is unclear exactly how many workers will be in the proposed bargaining unit. The plant is approximately 80% African American; making many optimistic that a civil rights-labor oriented community campaign can help the union carry off the difficult task of unionizing the plant. Workers at the plant say they are hoping to unionize in order to improve working conditions. Starting wages at the plant are a mere $13.50 an hour. Many workers are also forced to work as temps for years before being hired on full time. In addition, the plant has a history of being cited for safety concerns. Since 2008, OSHA has cited the Canton plant 6 times. In February of this year, OSHA fined the plant $20,000 for failing to provide proper lights to indicate when machinery was active. OSHA also cited the company for failing to instruct workers in how to properly shut off machinery before attempting to fix it. The union drive will most likely face stiff opposition from Nissan. “While it is ultimately up to our employees who will represent them, we do not believe that UAW representation is in the best interest of Nissan Canton and its workers,” Nissan spokesperson Parul Bajaj said in a statement released by the company. The UAW has accused Nissan of unfair labor practices and illegal firings in the past. In 2015, the National Labor Relations Board charged that the company and its temporary employee agency provider, Kelly Services, violated workers’ rights, with one manager threatening to close the plant if it went union. Although Nissan has said it is defending against the charge, the NLRB added new complaints against Nissan and Kelly Services in April of this year for threatening to close the plant if workers unionized. The NLRB also charged the company with breaking labor law by having security personnel perform unnecessary security stops on union members. Workers at the plant also say that management is also engaging in one-on-one anti-union meetings in an effort to intimidate workers. Not only are workers at the plant expected to face opposition on the shop floor, but also in the community. Already, the company has begun airing TV against the UAW warning of the consequences to the economic vitality of the plant if it unionized. Much like the successful anti-union campaign at Boeing, where the company spent $485,000 on advertising, the aim of the ads is to put community pressure on workers to vote against unionizing. However, the UAW has spent years building a community coalition to build support for workers at the plant, who are appxroximately 80% African-American. They have organized the Mississippi Alliance for Fairness at Nissan, which includes #BlackLivesMatter activists, church groups, the Sierra Club, the American Civil Liberties Union and the National Association for the Advancement of Colored People. 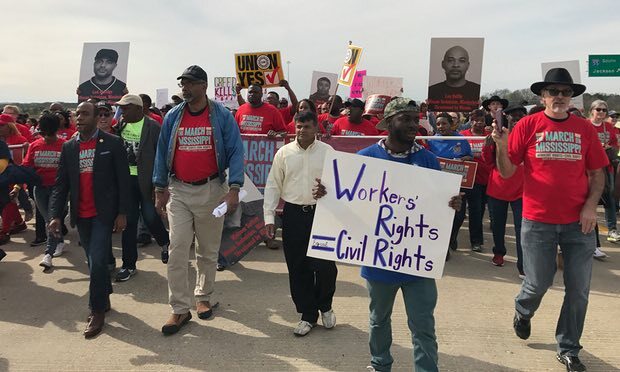 Many workers at the plant say that momentum begun to shift in the union’s favor after the massive 5,000 historic March on Mississippi organized against Nissan. The March 4 event featured Senator Bernie Sanders (I-VT), Danny Glover, and union activists from all over the South. (See Payday Senior Labor Reporter Mike Elk’s dispatch in the Guardian from the historic March on Mississippi). This is only the beginning of the process. It is unclear when the NLRB will schedule an election, and the election could face delays under the new GOP-led majority of the Trump Administration. But following failed union elections at Volkswagen in Chattanooga in 2014 and Boeing earlier this year in Charleston, South Carolina, a win at Nissan could be a game changer in terms of creating momentum for Southern organizing. Local activists remain optimistic about their chances. Mike Elk is a member of the Washington-Baltimore NewsGuild and is the senior labor reporter at Payday Report. He previously served as senior labor reporter at POLITICO and has written for the New York Times. He also writes the Guardian. Help Payday travel to Mississippi to cover the historic union election – Donate to our Summer Fundraising Drive Today!